Network scanning for an efficient workgroup. The Brother ADS-3600W Wireless Network Duplex Scanner seamlessly integrates into existing document management systems, combining reliability and productivity to meet the needs of the most demanding workforce. The innovative and space saving design of the ADS-3600W Desktop Scanner coupled with top-of-the-range speed makes this the perfect work partner for your busy office environment. Fast and reliable, it lets you enjoy error-free scanning for multiple documents. Along with outstanding imaging quality and ease-of-use, it effectively delivers top-of-the-class document capture benefits to please the most demanding professional. 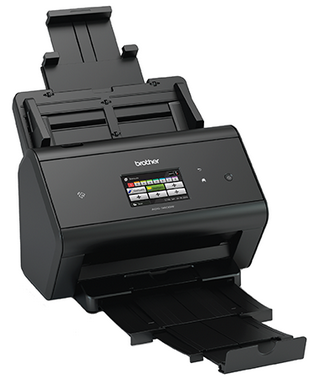 The Brother ADS-3600W High-Speed Desktop Scanner with Wired and Wireless Networking plus SuperSpeed USB 3.0 connectivity offers powerful features for mid- to large size workgroups that help simplify the way documents are captured, managed, processed, and delivered. Using the 50-page capacity auto document feeder, it captures single and double-sided documents in a single pass at speeds of up to 50ppm, making it perfect for scanning multi-page, two-sided business documents, as well as single-page documents up to 5000mm long, receipts, business and plastic cards.